The electric conduction in solid is a familiar physical phenomenon. When voltage V is applied to a conductor, current I flows. Ohm’s law tells I=GV, where G is called conductance. Beyond this conventional picture, is it possible to microscopically see how electrons flow in a quantum mechanical way? Dr. Kensuke Kobayashi presents his review article in this issue (pp. 204-221) to illustrate that mesoscopic systems, which are micron-sized electric devices, are the ideal test-bed to investigate such quantum transport. Figure (a) schematically shows a small opening for electron transport, whose width can be controlled electrostatically by gate voltage. This is a typical mesoscopic system called “quantum point contact (QPC)” and is realized in semiconductor hetero-structure as shown in the scanning electron microscope image in Fig. (b). Figure (c) shows the conductance G of QPC as a function of the gate voltage. When QPC is closed, G is of course zero. As the QPC is widened by the gate voltage applied, G gradually increases. Interestingly, G exhibits plateaus at certain gate voltage regions. The values are quantized to multiples of 2e2/h as shown in Fig. (c), where e and h are elementary charge and Planck constant, respectively. This conductance quantization reflects the wave nature of electrons. The shot noise S included in the current also conveys unique information. The noise corresponds to the variance of the number of electrons passing through QPC for a given time, whereas the current to its average. The dimensionless Fano factor F=S/2eI serves as a measure of the noisiness of the current. Figure (d) shows F as a function of G. When the conductance approaches to zero, F approaches to unity. 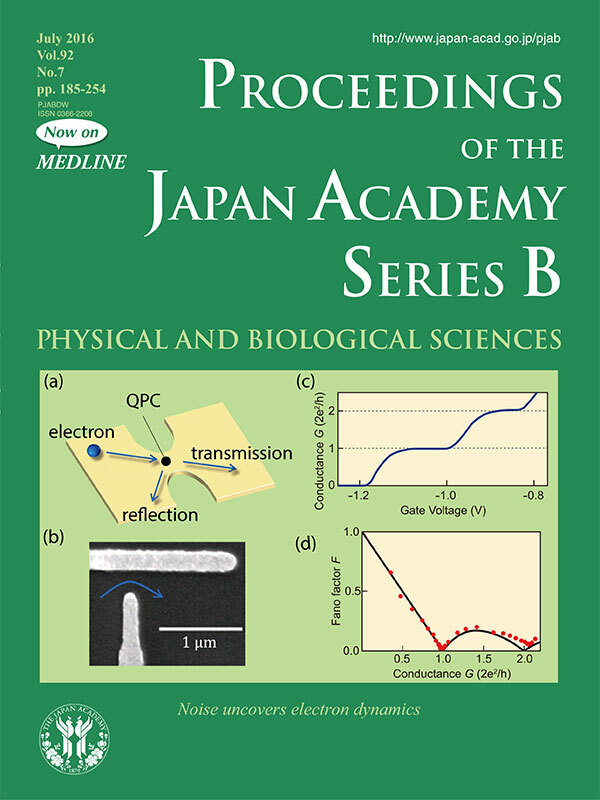 This means that each electron pass through QPC independently to obey the Poisson distribution. On the other hand, when G takes the quantized values, F is zero, indicating that the current is noiseless. This is the manifestation of the Pauli’s exclusion principle of electrons; they now flow avoiding each other, leading to the absence of the fluctuation. Thus, the shot noise allows one to address the quantum mechanical dynamics of electrons. This review article covers recent noise experiments in various mesoscopic systems and nicely demonstrates that by probing the noise one can explore the non-equilibrium physics in a precise and controllable way.